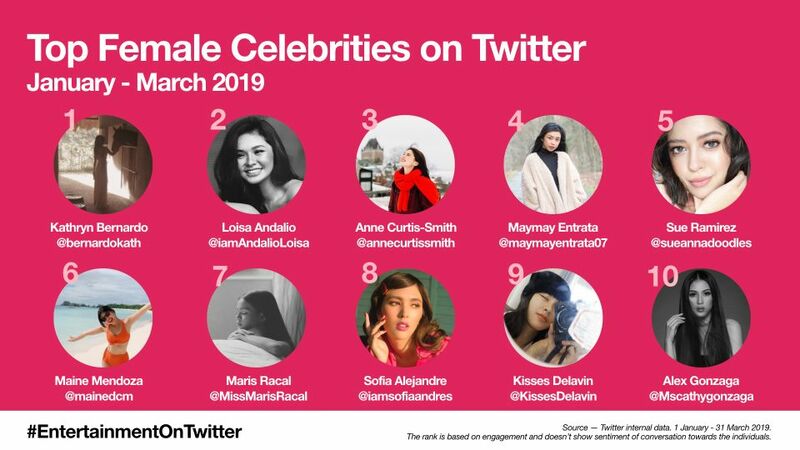 MANILA, 15 April 2019 – The Philippine entertainment scene always keeps Twitter buzzing, with Tweeps, not only from the Philippines but all over the world, talking about their favorite celebrities, their beloved loveteams or seryes they love to watch. Being the preferred platform for updates on the entertainment industry, Twitter releases the most talked-about and engaged entertainment icons in different categories for the first three months of 2019 so one can keep track of #WhatsHappening. Wherever Maine goes, Tweeps follow. #DaddysGurl isn’t an exception as the sitcom continues to trend regularly on Twitter with hashtags such as #DaddysGurlFirstCrush and #DaddysGurlBlindDate. Banking on Vic Sotto’s seasoned comedic chops and Maine’s natural wit, this show will definitely enjoy more time here in the top list. Ending just last March 22, PlayHouse became a daytime television hit because of the kilig that viewers felt while watching the show. 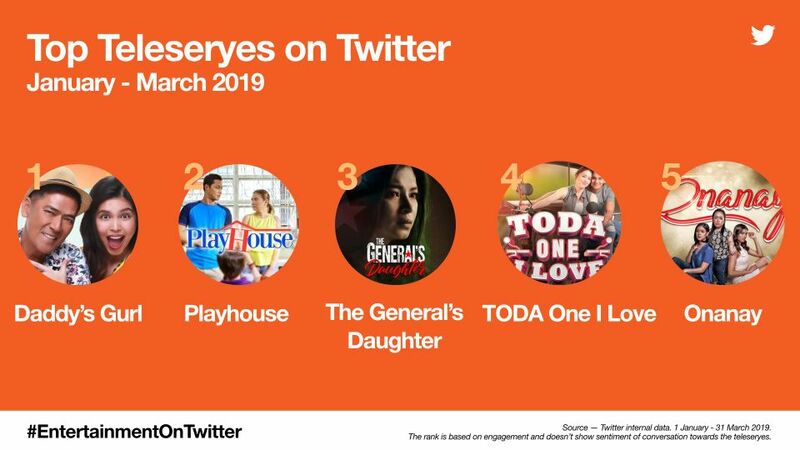 #PlayHouseFinallyHome, the show’s official hashtag for the finale, became a top trending topic as it aired, with fans expressing how much they will miss the show. Top-billed by Angel Locsin, The General’s Daughter never fails to make it to the top trending list. After years of being on hold and when it finally aired, the action-packed show earned the title as the “biggest teleserye of 2019” dominating the Twitter trends with such hashtags as #TGDWanted and #TGDImpormasyon. #TODAOneILove is not your typical TV show. Starring Kylie Padilla and Ruru Madrid, it dwells on political culture but with a kilig and comedic twist, winning the hearts of many Tweeps. Though it will end on April 17, fans expressed their wish to extend the show along with #TODAProtesta. Onanay’s stellar lineup and production team made it one of the most sought-after shows in the Kapuso network. Lead by veterans Nora Aunor and Cherie Gil, Onanay’s touching story about a mother’s love tugged the heartstrings of Tweeps all over the country. LizQuen fans and even non-fans gushed over the #AloneTogetherTeaser in January. Tweeps came up with their ‘theories’ on how the story between two college lovers from top universities would unfold. Eventually, when it finally aired, movie-goers shared their experience on how relatable the life and love stories were. As 2019 started, Nadine Lustre greeted her fans on the big screen, not with her reel- and real-life partner James Reid (@tellemjaye), but with Carlo Aquino. Aside from the fresh pairing the film offered, the plot sparked interest among Tweeps as they were intrigued by the creepy feeling they get about the film. #UlanMovie revolves around self-love due to the Philippine mythological creature ‘tikbalang’ or benevolent horse’s existence in the film. McLisse’s debut film was highly anticipated by fans. Tweeps expressed the good feels that they got from Sakaling Maging Tayo. Fans also went to Twitter to show their support when the film was starting to be pulled out of cinemas. They wanted more and they went to Twitter to say it. It’s never too early for a horror movie! Second Coming was finally shown on theaters after two years in the making. This also marked Jodi Sta. Maria’s comeback horror film which made Tweeps keen and curious about the movie. It was not about how scary the film was but about the lessons and the issues that were touched in the movie that captured people’s attention. The Twitterverse was filled with their insights, particularly on mental health issues tackled in the plot. He is indeed #UnstoppableDarren! Total performer Darren Espanto is in full throttle, owning the stage with Lani Misalucha and Jonalyn Viray at #TheACES concert in Araneta and setting the trend every Sunday with #DARRENrocksASAP and #FieryDARRENonAsapNatinTo. Darren’s Dying Inside To Hold You lands on the the 4th spot of iTunes CAMBODIA. Thank you so much for sharing this great news, @vanpasselbrothersmusic! ? This OPM darling is winning in love and career! Aside from her upcoming Idol Philippines stint as a judge, Tweeps rejoiced when Moira finally tied the knot with her musician beau, Jason Hernandez, using #AngTagpuan2019 and when their love story was featured in MMK with #MMKMoiraandJason. 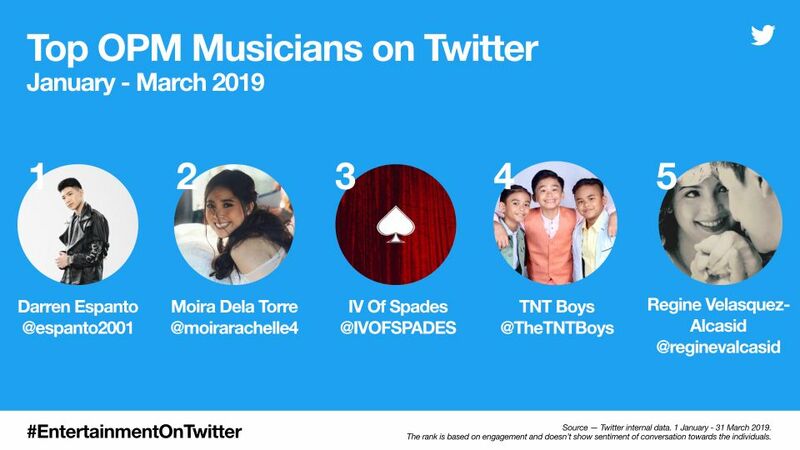 Now a three-piece band, IV of Spades surprised Tweeps with the release of their much-anticipated debut album, CLAPCLAPCLAP! with singles Bata Dahan-dahan, In My Prison, and #TakeThatMan. It’s also raining accolades for #IVOS as they won during the 4th Wish Music Awards and at the #50thBoxofficeEntertainmentAwards as the most Promising Recording/Performing Group. The TNT Boys wowed the world after appearing on the US reality talent show, The World’s Best, and belting it out with Ariana Grande on The Late Late Show with James Corden. To solidify their rapidly growing fanbase, Kiefer, Mackie, and Francis are all set with the #TNTBoysTheWorldTour in North America starting this April. Ever since her big transfer to the Kapamilya network, Asia’s Songbird Regine Velasquez-Alcasid has been busy with back-to-back performances with the young blood in the music industry. Her showcasing OPM on ASAP Natin ‘to every Sunday has been the talk of the Tweeps as Asia’s Songbird always takes the show to a world-class level. Celebrating her birthday in March, the actress is now #DauntlessQueenKathrynAt23. It was a triple celebration for Kathryn as she also celebrated for bagging the 50th Box Office Entertainment Awards together with Daniel Padilla for their movie The Hows of Us. She was also recently hailed as Favorite #TrendingPinoy at the 2019 Nickelodeon Kids’ Choice Award where fans voted with #VoteKathrynBernardo. 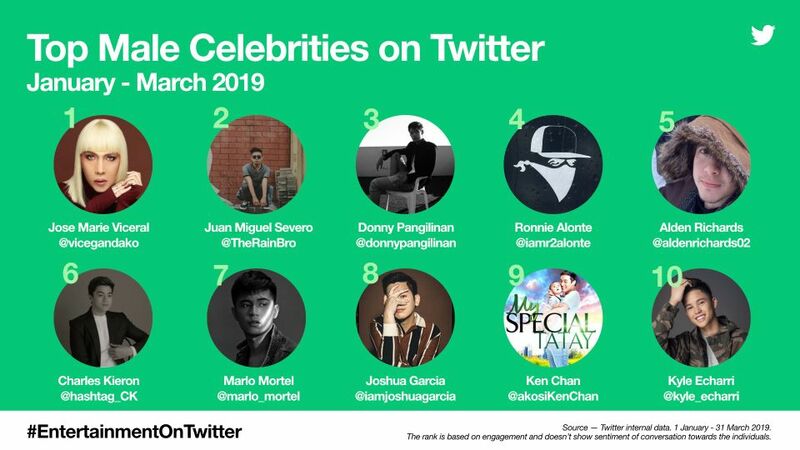 The half of the rising love team Loinie made it to the list. Loisa, playing the role of Claire, joined the star-studded teleserye The General’s Daughter which premiered in January. Fans have also been clamoring for the teen star’s upcoming film James and Pat and Dave with Ronnie and Donny. Anne Curtis remains to be one of the Philippines’ favorite celebrities as she shows up on our list once again. Aside from hosting noon-time show, It’s Showtime, she also recently went on a concert tour with the hashtag #ANNEkulitsaCanada which trended worldwide. At the homecoming concert for Miss Universe 2018 Catriona Gray, Maymay took over the Twitterverse with the hashtag #MaymayWalksforCatriona, as she conquered the runway with her own version of lava walk. Tweeps also raved as the actress portrayed the life of the beauty queen in the television drama anthology Maalaala Mo Kaya. Twitter buzzed with her fans’ support as Maymay released her title track “Kakayanin Kaya” from her second album, using the hashtag #MaymayKakayaninKaya. Apart from being a singer and an actress, Sue became one of the many style inspirations in the local entertainment scene, with fans always keen to see her latest Tweets on what her OOTD is. Fans would go as far as tweeting her that she looks like BLACKPINK’s very own Lisa Manoban. Aside from making people laugh from his jokes, Twitter’s top male celebrity for 2019 Vice Ganda (@vicegandako) turns to Twitter to give advice on love and life that people need to hear every once in a while, which endears him to his fans and followers. Hindi lahat ng pinoproblema mo e kailangan mo talagang problemahin. Yung iba dyan pinapalaki mo lang. Wag mong pahirapan ang sarili mo. Rising to fame as a talented spoken word poet, Juan Miguel now has a few acting gigs up his sleeve, and even released original songs, earning him a growing number of fans on Twitter. As a true artist, he is never one to shy away from speaking his mind as he uses the platform to share his opinions and to fight for his advocacies. Donny carved his name in the acting industry after garnering praises for his role as Zeke in the recently concluded hit TV drama PlayHouse. Fans loved his romantic team up with Kisses Delavin as #DonKiss that trended on Twitter conversations during the run of PlayHouse. Donny proves to be one of the rising stars of his generation. Hashtags Ronnie is not just your ordinary boy-next-door actor. Equipped with impressive dancing skills and acting abilities, Ronnie is set to become one of the most promising young actors today. Tweeps can watch him play as Ivan Cañega in the primetime show, The General’s Daughter. As usual, the Pambansang Bae is a constant in our list. Whether it’s his hosting stint at Eat Bulaga, sealing endorsements here and there, or teaming up with a new love interest, Alden continues to charm Tweeps that had them quipping #GwapoALDEN. 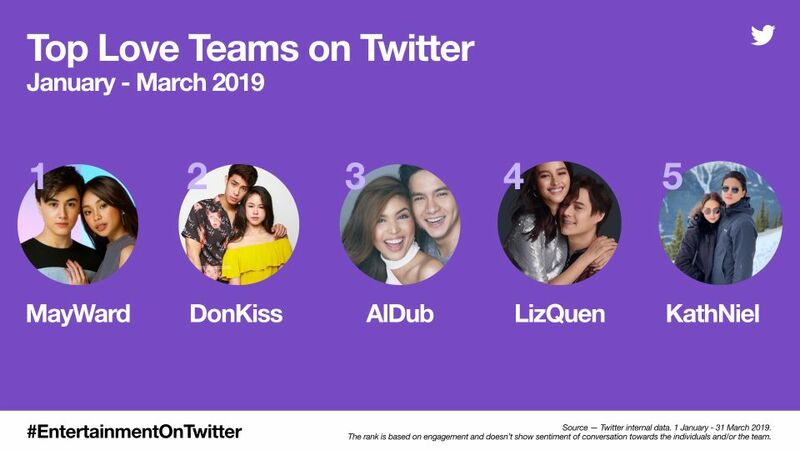 It comes to no surprise that #MayWard is the Top Loveteam on Twitter, as their support comes from their fans not just in the country but from all over the world. In the midst of releasing separate singles at the same time, Maymay (@maymayentrata07) and Edward (@Barber_Edward_) remain supportive of each other. The hashtag #iAmWithMayWard proves that fans have their backs whatever projects they embark on, together or on their own. We are seeing the rise of one of this generation’s hottest loveteams. The Donny and Kisses loveteam or DonKiss made its way to fame when they starred as Zeke and Shiela on the family-oriented TV series PlayHouse. This success even brought them an online series ZeKey to Shiela’s Heart (#ZEKEytoSHIELAsHeart) on iWant. There’s no denying that Maine and Alden are still making waves on Twitter — thanks to the solid support of the #AlDubNation. Despite them pursuing projects separately, fans showed their loyalty to the loveteam using the hashtags #ALDUBNationUnitedAsFam and #ADNKakayanin to Tweet their continued support for the loveteam. Liza’s (@lizasoberano) and Enrique’s (@itsenriquegil) portrayal as rekindling ex-lovers in #AloneTogether left Tweeps shookt with all the feels. 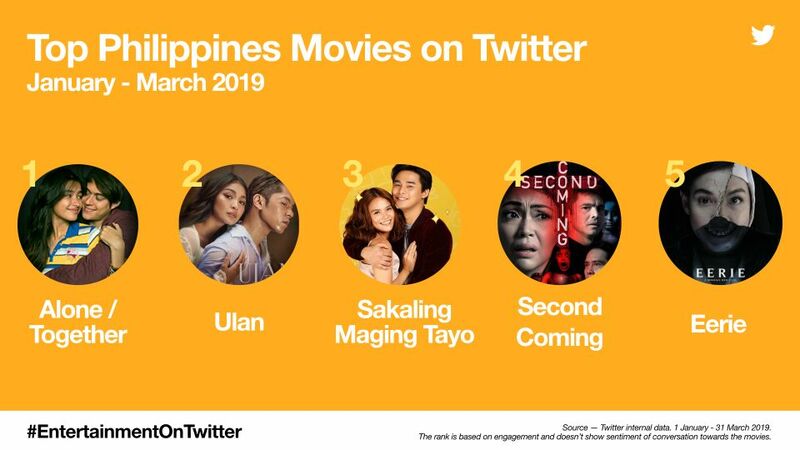 #LizQuen fans rallied to Twitter to extensively promote the movie, and while Raf and Tin’s love story gets complicated in the movie, fans can rest assured that #LizQuenIsReal. The Royals are back! Being the iconic love team that they are, Teen King and Queen #KathNiel became the inspiration behind the viral social serye that broke the internet, #AlongEspaña. Another feather in their cap is when they bagged the Phenomenal Stars of the Philippines award, and fans celebrated with them using the hashtag #KathrynDanielPhenomenalStars. I didn’t noticed he was holding her hand the whole time he was giving his birthday message for her ? ?